"Jorge Mário da Silva was born in 1970 in Belford Roxo in Rio de Janeiro, and soon he already knew that he wanted to be a musician. He went through various jobs since he was 10 years old, was a frequenter of dances and samba wheels from Rio de Janeiro, and began to sing very young at night. He left home at age 19 and lived on the street for a few years, where he made his first contact with the theater. Discovered by clarinetist Paulo Moura, he made a test for a musical and since then his life has completely changed. Seu Jorge defines himself as a popular singer and composer, who likes countless musical genres, but whose foundation is the samba: The samba is our truth, our particularity, it is our gold medal, our bulwark, our Brazilian standard." Amigo de meterse en más de un jardín (en una ocasión se avergonzó de ser inglés y en otra boicoteó un disco suyo por sus precios desorbitados), en España faltaba disfrutar de Elvis Costello tocando literalmente en uno, omisión salvada en esta última gira con un coto para el buen rollo, aunque algo embarrado. Recién llegado de su actuación de anoche en el festival Jardins de Pedralbes de Barcelona, el hombre nacido como Declan Patrick MacManus ha inaugurado esta noche la tercera edición del madrileño Noches del Botánico, en un entorno vegetal al raso que aparentemente favorecía el disfrute y resonancia de todas sus facetas musicales. Ha sido en un programa doble que ha comenzado a colorear el brasileño Seu Jorge, concretamente de verde carioca, tanto la flora circundante como los clásicos de David Bowie ("Life on Mars" o "Starman", por ejemplo) que acomete en su disco "The life aquatic studio sessions". Después ha sido el turno de Costello, más habitual en la escena madrileña, la cual acostumbra a agitar aproximadamente cada tres años y siempre bajo fórmulas nuevas, ya sea en formato acústico, como la que lo trajo por última vez al Teatro Monumental en 2016, o acompañado, como cuando en 2007 compartió escenario con su amigo Allen Toussaint. A la capital española ha venido esta vez junto a The Imposters, la banda que lo parapeta desde principios de siglo y en la que militan algunos de sus primeros correligionarios, los míticos exThe Attractions Steve Nieve a las teclas y Pete Thomas a la batería, además de Davey Faragher al bajo. De su mano ha procurado a un aforo completo (3.600 personas, según la organización) un repaso de 1 hora y 40 minutos por lo más granado de su vasta producción, sobre todo de la primera mitad de esas dos docenas de discos de estudio en solitario (y un puñado más en colaboración) que arrancaron en la escena londinense pub-rock de los años 70 y tuvieron sus escarceos con el punk. Provisto de sus icónicos gafotones, el espectáculo ha arrancado pasadas las diez y media de la noche con "Wonder woman" y un sonido que ensuciaba esas canciones que compuso "cuando era solo un muchacho", como "Less than zero", primer sencillo de su carrera, la tónica soul de "Tears before bedtime" o la psicodelia de "(I don't want to go to) Chelsea". "Es estupendo estar de vuelta en Madrid", ha proclamado aparentemente ajeno a los avatares del sonido embarrado, especialmente en la mezcla y en la amplificación de la voz, que se comportaba mejor ante temas más sosegados como "Watching the detectives" y el toque "crooner" de "You shouldn't look at me that way" o "God give me strength", compuesto junto a Burt Bacharach. Realmente hasta transcurrida una hora, cuando han sonado "Everyday I write the book" y "Pump it down", no ha aflorado la energía vibrante que se le presupone a una cita de rock de una leyenda como el británico. Tras una breve pausa ha dado comienzo la segunda parte del concierto, más acústica e introducida a modo de largos bises, con "Alison" en un sencillo formato de guitarra y voz en el que el público pedía silencio primero y se unía después a la canción. Arropado por el piano ha dado paso luego a "Accidents will happen" y la emblemática "She", recibida por el respetable con una sonora ovación, aunque por momentos se han hecho evidentes ciertos problemas de garganta que ponían en peligro la afinación. Como el largo invierno que acompañó este año a Madrid, al concierto de Costello parecía faltarle algo más de sol, un fuego que calentara del todo al respetable, tibio sobre todo en la grada en cuanto a muestras de efusividad ante tanto altibajo en el repertorio. El final, no obstante, ha estado entre lo mejor de la velada, con un remate "in crescendo" en el que, con oficio y toda la banda de vuelta, ha reflotado la unanimidad de los aplausos gracias a temas como el broche con apuntes electrónicos de "(What's So Funny 'Bout) Peace, Love & Understanding". Friend of getting into more than one garden (once he was embarrassed to be English and in another boycotted a disc of his by exorbitant prices), in Spain was missing Elvis Costello playing literally in one, omission saved in this last tour with a preserve for the good roll, although something muddy. Just arrived from his performance last night at the Jardins de Pedralbes festival in Barcelona, ​​the man born as Declan Patrick MacManus has opened tonight the third edition of the Noches del Botánico from Madrid, in an open-air plant environment that apparently favored the enjoyment and resonance of all its musical facets. It has been in a double program that has begun to color the Brazilian Seu Jorge, specifically from Rio de Janeiro green, both the surrounding flora and David Bowie's classics ("Life on Mars" or "Starman", for example) that rushes on his disc "The life aquatic studio sessions". 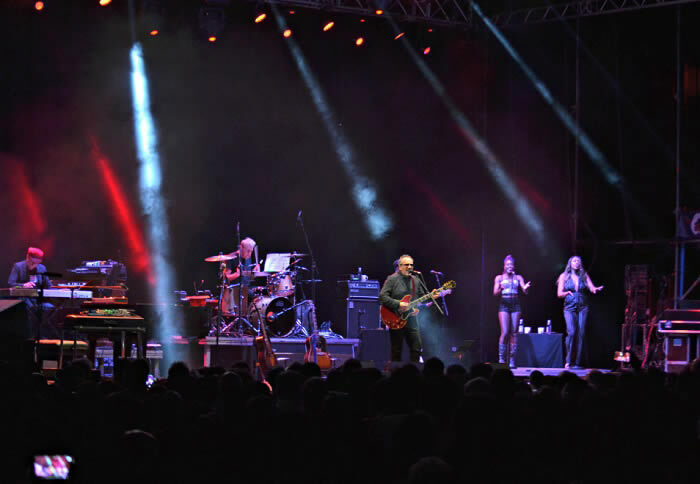 Then it was Costello's turn, more usual in the Madrid scene, which he used to shake approximately every three years and always under new formulas, either in acoustic format, like the one that brought him for the last time to the Teatro Monumental in 2016, or accompanied, as when in 2007 he shared the stage with his friend Allen Toussaint. The Spanish capital has come this time with The Imposters, the band that has been parading it since the beginning of the century and in which some of its first coreligionists, the legendary exThe Attractions Steve Snow on the keys and Pete Thomas on drums, also play. by Davey Faragher at the bass. In his hand has procured a full capacity (3,600 people, according to the organization) a review of 1 hour and 40 minutes for the most outstanding of its vast production, especially the first half of those two dozen studio albums solo (and a handful more in collaboration) that started on the London pub-rock scene of the 70s and had their dalliances with punk. Equipped with its iconic gafotones, the show has started after ten thirty at night with "Wonder woman" and a sound that messed up those songs that he composed "when I was just a boy", like "Less than zero", first single from his career, the soul tonic of "Tears before bedtime" or the psychedelia of "(I do not want to go to) Chelsea". "It's great to be back in Madrid", he proclaimed apparently oblivious to the avatars of muddy sound, especially in the mixing and amplification of the voice, which behaved better to more sedate subjects such as "Watching the detectives" and the touch "crooner" from "You should not look at me that way" or "God give me strength", composed with Burt Bacharach. Really until one hour, when they have sounded "Everyday I write the book" and "Pump it down", has not surfaced the vibrant energy that is presupposed to a rock appointment of a legend like the British. After a short pause the second part of the concert began, more acoustic and introduced as long encores, with "Alison" in a simple guitar and voice format in which the audience asked for silence first and then joined the song . Clothed by the piano has given way to "Accidents will happen" and the emblematic "She", received by the respectable with a loud ovation, although at times certain throat problems that endangered the tuning have become evident. 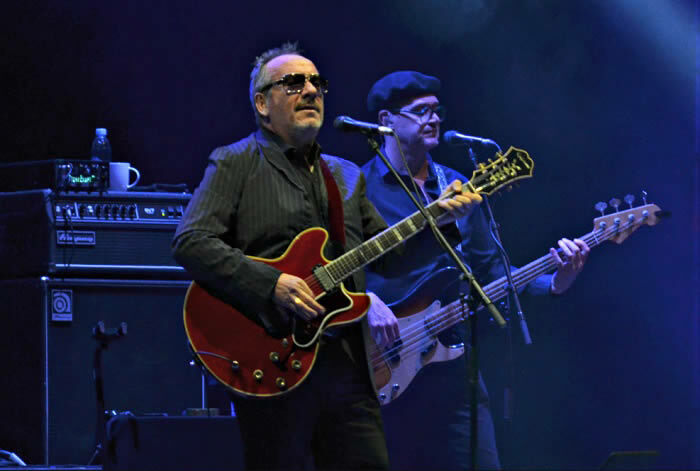 Like the long winter that accompanied this year to Madrid, the concert of Costello seemed to lack more of the sun, a fire that warmed up the respectable, warm especially in the stands as to samples of effusive before so much ups and downs in the repertoire. The end, however, has been among the best of the evening, with an "in crescendo" ending in which, with trade and the whole return band, has re-floated the unanimity of the applause thanks to themes such as the brooch with notes electronic "(What's So Funny 'Bout) Peace, Love & Understanding". Thoses gafatones drive me crazy when I'm trying to record music !!! We started summer, cycle and concert. 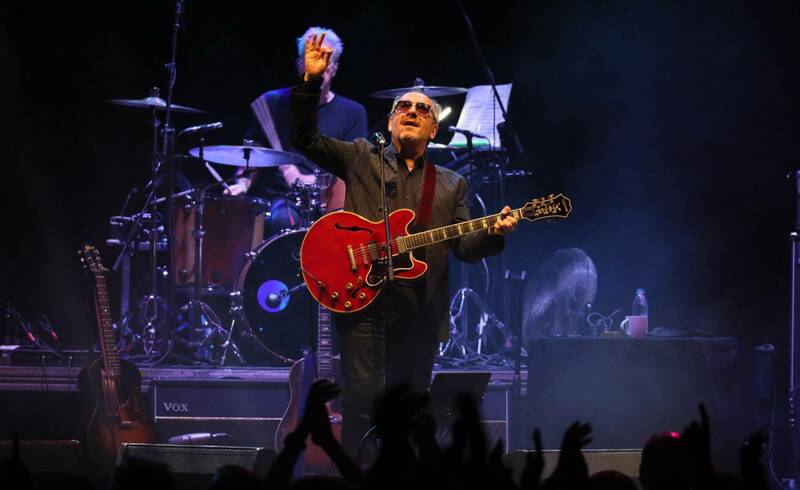 On Music Day, Elvis Costello gave the kick-off -guitar in hand- to the Botanical Nights in Madrid. When the sun began to crouch, we left our hiding places towards the Royal Botanical Garden of the Complutense University of Madrid. To enjoy the beginning of a cycle through which Joan Manuel Serrat, Rufus Wainwright, James Rhodes or Norah Jones will pass. Last night it was the turn of Declan Patrick MacManus (Elvis Costello, for mortals) and there was no better plan. There is not a great display in the staging. Neither space lights, nor decorated, not even the side screens project their image. He has not come to make a visual spectacle, but to give a concert. He is accompanied by keyboardist, bass, drums and two choristers. It does not need more. Hide what you want under your dark suit and sunglasses, parapetado by a guitar that caresses with great ease. While doing so, walk through its history with the tranquility of whoever has it. It is curious to go from listening to the albums of the late seventies to hear their live versions in 2018. It is perceived more a slight relaxation in the voice, in the times, less urgency, less speed than in the past singing and playing. 'Clubland' ("Trust", 1981) sounds smoky, with that game between piano and guitar that fogs the night. 'I do not want to go to' Chelsea 'transports us to the "This year's model" of 1978. They are small lessons on how to finish putting together a song destined to stay. Because only those pieces born with sufficient substance stand the test of time and take advantage of it. Although others, like 'Pump it up', remain intact their freshness and vitality for four decades. From rock and roll, but through soul and even reggae, the Briton does not grant more silences than those in which he leaves the stage to return with the encores. Yes, let the instrumental passages lengthen, let the songs live far beyond the voice. When he sings everything becomes warm. However, sometimes the role of their two choristers dancing (what kind of zumba, they say around) and highlighting their lyrics becomes excessive. In that sense, he has a bit of sweetening to the show. It is even more noticeable when he strips naked, as he does at the most magical moment of the evening. Hand in hand with his inseparable Steve Snow, they face piano and voice 'Accidents will happen', transferring a feeling of calm, intimacy and nostalgia difficult to describe. A clever way to prepare the environment before listening to the dream version of the classic 'She' that silences the garden. There he reminds us that true beauty, naked, is even more immortal. Last edited by sweetest punch on Fri Jun 22, 2018 3:39 pm, edited 1 time in total. Pese a su aspecto de eterno joven despistado y rebelde, Elvis Costello es ya un sexagenario con cuatro décadas de carretera a las espaldas y tantas canciones inmensas que no podíamos reprocharle el anuncio de que había puesto fin a su producción discografía. Pero anoche se acumulaban las buenas noticias: echaba a andar en la Complutense la tercera edición de Noches del Botánico, más prometedora que ninguna otra; Costello se nos plantificó ante 3.600 almas con sus The Imposters, que es banda enorme; y ahora resulta que sí nos entregará canciones nuevas en otoño, y no se le conoce un disco malo. Las buenas perspectivas se empañaron con la voz a ratos devastada de nuestro protagonista, que se atrevió a afrontar composiciones complejísimas (la fabulosa God give me strenght, que no entraba en las previsiones) en las que la emoción dirimía una batalla encarnizada con sus dificultades evidentes frente al micrófono. Había amenizado la espera el carioca Seu Jorge -personaje estrafalario y dueño de una preciosa voz de barítono- con sus heterogéneas lecturas en portugués de David Bowie, esas que grabó para la película de Wes Anderson The life aquatic y nunca nos había acercado antes por aquí. Y Elvis se nos demoró hasta las 22.32, cuando la noche ya se había adueñado del día más largo. Pero nadie en el Botánico parecía pendiente del reloj: liberado de estrenos discográficos, el jefazo británico podía relamerse con éxitos new wave y debilidades personales de un catálogo tan asombroso como casi inabarcable. Además de la voz cantante, Costello ejerce como único guitarrista en escena. Son las ventajas de acumular muchas horas de vuelo y rodearse con fieras como el teclista Steve Nieve, pletórico de imaginación siempre. Flojeaba extrañamente el sonido, algo embarullado y rácano en decibelios, y alguna pieza menos usual (Shabby doll) anduvo ya imprecisa de afinación. Pero el primer gran momento del verano llegó con la desolada Tears before bedtime, donde el respaldo de las dos coristas negras acentuaba la hondura del batacazo sentimental. El panorama se enturbió a partir de Watching the detectives, un clásico al que no se le agota la mecha pero con el que el bueno de Declan MacManus pareció atragantarse de manera inesperada. Y los apuros con su garganta imprecisa los corroboramos en You shouldn’t look at me that way, una ambrosía de crooner que vivimos más preocupados por las notas agudas que por la gozosa excelencia de su escritura. Lo mejor de un hombre con tanto repertorio y recursos es que ni se achanta ni elude los retos. El falso final de Pump it up era un festín y un amago de adiós, apenas prolongado durante un minuto, que ocultaba una buena tanda de bises. Inaugurados con Alison en lectura desnudísima (guitarra, voz y coros), para marcar territorio. En una situación de apuro, el problema de Costello es que carece de canciones sencillas y no puede eludir los laberintos de sus partituras. El sonido había mejorado mucho y nuestro hombre se desgañitó con Accidents will happen y She, donde las imprecisiones podían lidiarse con toneladas de pundonor. Pero Adieu Paris, sentado al piano de cola, se tornó en crudo sufrimiento colectivo. La segunda mitad de la noche, que en la hoja de repertorio comprendía 13 piezas, quedó reducida a siete e incluyó un homenaje a Allen Toussaint (“un buen amigo que nos dejó precisamente en esta ciudad”) que tampoco figuraba en el guion. El final sí que fue el previsto, ese (What’s so funny about) Peace, love and understanding prestado por Nick Lowe, pero el entusiasmo en el jardín no podía ser tanto como habría señalado cualquier pronóstico. Mucho mérito para una mala noche; un balance agridulce. En su fascinante autobiografía, Música infiel y tinta invisible, este Elvis ventilaba su escasa adhesión monárquica con una frase deliciosa: “En mi casa no siempre nos pareció buena idea que Dios salvara a la reina”. Nosotros, después de lo de anoche, siempre podremos rogarle a los cielos que le guarden muchos años a él. Y, por favor, a su garganta. Despite his appearance of eternal clueless and rebellious youth, Elvis Costello is already a sexagenarian with four decades of road behind his back and so many immense songs that we could not reproach him for the announcement that he had put an end to his discography production. But last night the good news accumulated: the third edition of Nights of the Botanist began to walk in the Complutense, more promising than any other; Costello was planted before 3,600 souls with his The Imposters, which is a huge band; and now it turns out that he will give us new songs in the fall, and he does not know a bad record. The good prospects were clouded with the devastated voice of our protagonist, who dared to face very complex compositions (the fabulous God give me strenght, which did not fit into the forecasts) in which the emotion resolved a bitter battle with its obvious difficulties in front of the microphone. He had entertained the wait the carioca Seu Jorge - quirky character and owner of a beautiful voice of baritone - with his heterogeneous readings in Portuguese by David Bowie, those he recorded for the Wes Anderson movie The life aquatic and had never approached us before here . And Elvis delayed us until 10:32 PM, when the night had already taken over the longest day. But no one in the Botanic seemed to be watching the clock: released from record releases, the British boss could relate to new wave successes and personal weaknesses of a catalog as amazing as almost untouchable. 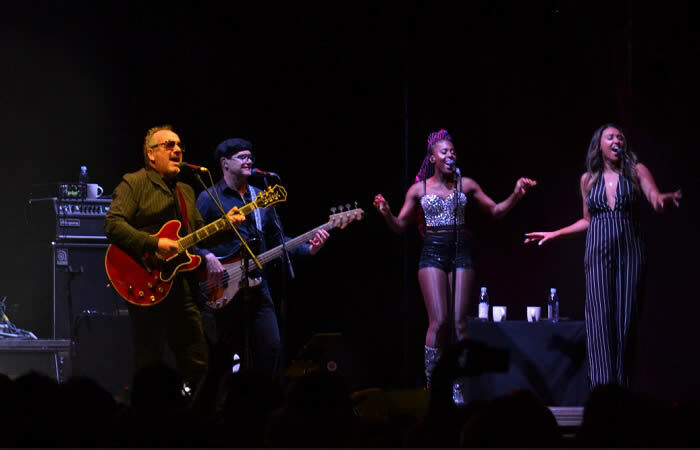 In addition to the singing voice, Costello exercises as the only guitarist on stage. These are the advantages of accumulating many hours of flight and surrounding yourself with beasts such as keyboardist Steve Nieve, always full of imagination. The sound strangely floated, something jumbled and raked in decibels, and some less usual piece (Shabby doll) was already inaccurate tuning. But the first big moment of summer came with the desolate Tears before bedtime, where the backing of the two black chorus accentuated the depth of the sentimental bump. The panorama blurred from watching the detectives, a classic that does not run out of the fuse but with which the good of Declan MacManus seemed to choke unexpectedly. And the troubles with his imprecise throat we corroborate them in You should not look at me that way, an ambrosia of crooner that we live more worried about the acute notes that for the joyful excellence of his writing. In a situation of haste, Costello's problem is that he lacks simple songs and can not avoid the labyrinths of his scores. The sound had improved a lot and our man shied away with Accidents will happen and She, where inaccuracies could deal with tons of pride. But Adieu Paris, seated at the grand piano, turned into raw collective suffering. The second half of the night, which in the repertoire sheet comprised 13 pieces, was reduced to seven and included a tribute to Allen Toussaint ("a good friend who left us precisely in this city") that did not appear in the script either. The end was what was planned, that (What's so funny about) Peace, love and understanding provided by Nick Lowe, but the enthusiasm in the garden could not be as much as any forecast would have indicated. Much merit for a bad night; a bittersweet balance. Last edited by sweetest punch on Fri Jun 22, 2018 3:41 pm, edited 1 time in total. sweetest punch wrote: It is even more noticeable when he strips naked, as he does at the most magical moment of the evening. It must have been quite a show. Review credited to EFE published in La Voz de Galicia, on 22 June, 2018. Recién llegado de su actuación en el festival Jardins de Pedralbes de Barcelona, Elvis Costello ha inaugurado este jueves la tercera edición del madrileño Noches del Botánico, en un entorno vegetal al raso que aparentemente favorecía el disfrute y resonancia de todas sus facetas musicales. Ha sido en un programa doble que ha comenzado a colorear el brasileño Seu Jorge, concretamente de verde carioca, tanto la flora circundante como los clásicos de David Bowie (Life On Mars o Starman, por ejemplo) que acomete en su disco The Life Aquatic Studio Sessions. A la capital española ha venido esta vez junto a The Imposters, la banda que lo parapeta desde principios de siglo y en la que militan algunos de sus primeros correligionarios, los míticos ex-The Attractions Steve Nieve a las teclas y Pete Thomas a la batería, además de Davey Faragher al bajo. Provisto de sus icónicos gafotones, el espectáculo ha arrancado pasadas las diez y media de la noche con Wonder Woman y un sonido que ensuciaba esas canciones que compuso «cuando era solo un muchacho», como Less Than Zero, primer sencillo de su carrera, la tónica soul de Tears Before Bedtime o la psicodelia de (I Don't Want to Go to) Chelsea. «Es estupendo estar de vuelta en Madrid», ha proclamado aparentemente ajeno a los avatares del sonido embarrado, especialmente en la mezcla y en la amplificación de la voz, que se comportaba mejor ante temas más sosegados como Watching the Detectives y el toque «crooner» de You Shouldn't Look At Me That Way o God Give me Strength, compuesto junto a Burt Bacharach. Realmente hasta transcurrida una hora, cuando han sonado Everyday I Write the Book y Pump it Down, no ha aflorado la energía vibrante que se le presupone a una cita de rock de una leyenda como el británico. Tras una breve pausa ha dado comienzo la segunda parte del concierto, más acústica e introducida a modo de largos bises, con Alison en un sencillo formato de guitarra y voz en el que el público pedía silencio primero y se unía después a la canción. Arropado por el piano ha dado paso luego a Accidents Will Happen y la emblemática She, recibida por el respetable con una sonora ovación, aunque por momentos se han hecho evidentes ciertos problemas de garganta que ponían en peligro la afinación. El final, no obstante, ha estado entre lo mejor de la velada, con un remate «in crescendo» en el que, con oficio y toda la banda de vuelta, ha reflotado la unanimidad de los aplausos gracias a temas como el broche con apuntes electrónicos de (What's So Funny 'Bout) Peace, Love & Understanding. El festival Noches del Botánico llega a su tercera edición con cada vez más fuerza y adeptos. Hasta el 29 de julio, el Real Jardín Botánico de la Universidad Complutense de Madrid recibirá figuras como David Byrne, Simple Minds, Norah Jones y Ky-Mani Marley, hijo de Bob Marley, entre las 30 atractivas propuestas musicales previstas. La diversidad musical y artística es uno de los puntos fuertes del evento. Rock, rap, reggae, pop y música electrónica se mezclarán en esas noches de verano en la capital española. Las entradas cuestan entre 20 y 60 euros." The Spanish capital has come this time with The Imposters, the band that has been parading it since the beginning of the century and in which some of its first coreligionists militate, the legendary ex-The Attractions Steve Nieve on keys and Pete Thomas on drums , in addition to Davey Faragher on bass. With its iconic gafotones, the show has started after half past ten at night with Wonder Woman and a sound that messed up those songs that he composed "when he was just a boy", such as Less Than Zero, the first single of his career, tonic soul of Tears Before Bedtime or the psychedelia of (I Do not Want to Go to) Chelsea. «It's great to be back in Madrid», he proclaimed apparently oblivious to the avatars of muddy sound, especially in the mixing and amplification of the voice, which behaved better to more sedate subjects such as Watching the Detectives and the touch «crooner »From You Should not Look At Me That Way or God Give me Strength, composed with Burt Bacharach. Really until one hour passed, when Everyday I Write the Book and Pump it Down have sounded, has not surfaced the vibrant energy that is presupposed to a rock appointment of a legend like the British. After a brief pause the second part of the concert began, more acoustic and introduced as long encores, with Alison in a simple format of guitar and voice in which the audience asked for silence first and then joined the song. Clothed by the piano has given way to Accidents Will Happen and the emblematic She, received by the respectable with a loud ovation, although at times certain throat problems have become evident that endangered the tuning. The end, however, has been among the best of the evening, with a shot "in crescendo" in which, with trade and the whole band back, has re-floated the unanimity of the applause thanks to themes such as the brooch with notes Electronic (What's So Funny 'Bout) Peace, Love & Understanding. The festival Nights of the Botanist reaches its third edition with more and more strength and followers. Until July 29, the Royal Botanical Garden of the Complutense University of Madrid will receive figures such as David Byrne, Simple Minds, Norah Jones and Ky-Mani Marley, son of Bob Marley, among the 30 attractive musical proposals. The musical and artistic diversity is one of the strong points of the event. Rock, rap, reggae, pop and electronic music will mix on those summer nights in the Spanish capital. Tickets cost between 20 and 60 euros. "